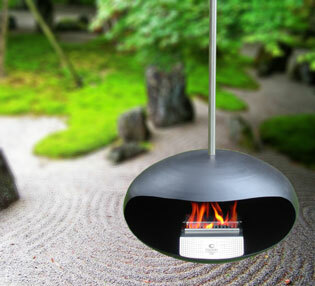 Cocoon, the cheeky new Bio-Fuel, Feature Fireplace. It’s full of character and will quickly brighten up any indoor or outdoor space. Cocoon Fires from Peru’s celebrated Otero Design Studio make an exciting addition to AGNEWS Fireplaces suite of Bio Fuel feature fires. 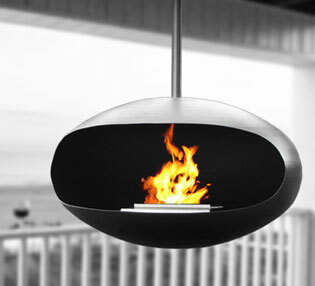 Agnews believe Cocoon Fires are set to make a big impact on designers when they discover the amazing possibilities for this style of feature fireplace.It's Cocoon’s design simplicity that makes them so adaptable and attractive. The cheeky, contemporary styling makes its own statement. The choice of matt black or mirror-polished stainless steel finishes coordinates brilliantly with today’s décor mix. Compact, just 60cm diameter, and available in freestanding or hanging formats enables Cocoon to be positioned in just about any indoor or outdoor location. An easy to manage burner system burns for up to five hours using environmentally sensitive Bio-Fuels and emits less CO2 than two medium candles. Cocoon’s contemporary style and intrinsic versatility provided the perfect solution for a busy Wine Bar in West Australia’s South West Wine Region. The ability to relocate Cocoon by fitting multiple hanging brackets enhanced Cocoon’s value to the Wine Bar. By day, Cocoon is used in the front area to greet passing traffic and by night it creates a beautiful, warm ambience for the main dining area.